There is no greater feeling than looking out over your own backyard and feeling proud of what you see. A beautiful garden is relaxing, makes entertaining guests a fun experience and adds value to your property. 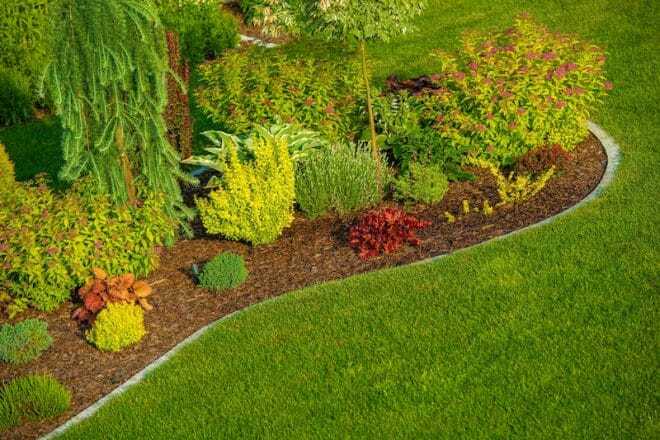 Just like any other part of your home, a garden needs maintenance and attention to bring out it’s best. Thankfully with the right tips and ideas, you can beautify your backyard in no time at all (and on a small budget, too). If your backyard is feeling tired and in need of a makeover, you’ve come to the right place. From 20 years of updating and refreshing gardens across Victoria, here are our top ideas to make your backyard beautiful again. An alfresco area is an outdoor room you can enjoy year-round, particularly during the summer months. It’s the perfect way to extend your home and provide a place to enjoy your home with a stunning natural backdrop. It could be a dining room, kitchen, guest bedroom or simply another entertainment space. Building a new alfresco area will blend your indoor and outdoor life perfectly. While a pergola or patio can be a great project, alfresco areas are different because the roof is an extension of your house. This creates a seamless and modern effect and provides an elegant finish that will wow your guests and add value to your property. Where would we be without our good old Aussie BBQs? A BBQ is the centrepiece of any event or party. You can also make it the centrepiece of your backyard. Say goodbye to the days of fitting a small Webber just outside your back door – and hello to an outdoor kitchen space that makes your backyard the toast of the neighbourhood. Design and create your own BBQ space with an outdoor fridge, sink, table space and room for countless guests. Choose bricks or tiles for a high-quality finish that enhances your yard and turns it into your own private function room. Hello summer! If your neighbours are a little too nosey, or if you’d like to add a splash of style to your yard, look no further than privacy screens. They are functional, look great and can be made from a range of quality materials. Place them anywhere to block an outside view, create a division or just give your garden some much-needed texture or colour. Choose stone for natural variation, timber for a bit of warmth or go with steel for a more industrial finish. Build them high or low, big or small. The choice is yours. You don’t need to construct anything or pay big dollars to give your backyard the refresh it deserves. Go back to basics and consider how natural elements like trees, shrubs and flowers could be all it takes to get the job done. Planting is an excellent way to breathe life into a tired garden. Like fashion or art, choose yourself a colour palette that complements your home. Throw in some bold colours like purple and yellow, mix in some similar shades like lilac and do some edge work on the garden beds. New backyard, old tricks! You don’t have to own a big yard to add a water feature. It can be cost-effective, look amazing and bring some relaxation back into your life. If you haven’t had a water feature or pond in your garden before, you have to try it to experience the difference it really makes. They are perfect for a home, public or business setting and bring another level of elegance to your entertaining. Best of all you can design and build one you like from a range of serene styles. Do it yourself or call in the professionals. Just remember, the key to a great water feature is in the materials and the craftsmanship. Choose wisely for a finish you’ll be proud of. Want to turn your backyard into your own private summer getaway? You can do it with shade sails. Large, elegant and great for sun protection, a shade sail will make garden entertaining, relaxing or playing with the kids outside simple. They look fantastic, too! Shade sails come in many shapes and sizes so there’s one made for your home. There are plenty of practical and waterproof options. Choose a colour that will bring out the best in the space you’re working with. Shade sails are great additions to a pergola, patio and an outdoor setting. Once it’s installed, all that’s left to do is sit back and relax. Everlast Services are the landscaping experts in Melbourne, with over 20 years’ experience creating incredible gardens for our customers. If you’d like some help to take yours to the next level, give us a call today.